Sunday’s 3-0 victory over Manchester United was a tremendous display, one that has left us all purring. We simply brushed the Red Devils aside and put the game to bed in the first 20 minutes. Every screw in our machine was tight and well-oiked while our pace and aggression broke the experienced yet meek opponents’ wall in the middle of the park. The visitors, who had conceded just five goals before Sunday, were powerless. Here are the key points from our victory. 1. Petr Čech has proven the difference between a world-class and excellent goalkeeper. Here is a statement that might sound like a shock. David Ospina is an excellent goalkeeper and neither the fact that people have forgotten his role in our spectacular 2015 performances nor the occasional blunder like the one against Olympiacos won’t change this. However, there is that fine line, almost invisible to the naked eye, that makes a difference between a world-class goalkeeper and Ospina’s level of excellence. Petr Čech has made that line more visible in league matches against Liverpool, Leicester City and Manchester United. His save of Anthony Martial’s shot was one of the most crucial moments of the match, it essentially secured us a peaceful second-half. It wasn’t the only time Čech denied a consolation goal for the visitors, he made a lovely save of Wayne Rooney’s attempt in the second half as well. 2.Arsenal’s Spaniards are arguably the best pair of full-backs in the league right now. Keeping an eye on a footballing wizard like Juan Mata is never easy but Nacho Monreal did a splendid job to deny his compatriot any impact on the game. Granted, it’s much easier to be a full-back when you have a “perpetuum mobile” in the shape of Alexis Sanchez just in front of you but the example of Kieran Gibbs proves that Nacho Monreal deserves some credit as well. And what is there to say about Hector Bellerin? It’s like watching a right-back version of the early Cesc Fabregas growing week in, week out in front of our own eyes relieved of the whole crap about his ‘Barcelona-DNA’. Bellerin offered width going forward as usual and it was nice to see how Memphis Depay looked out of depth whenever he tried to break our defensive wall. 3.Francis Coquelin is the best defensive midfielder in the league. Behind every successful man there is a woman. Behind every successful Arsenal attack is Francis Coquelin’s tackle. Just like against Stoke, the Frenchman’s tackle was the first step to our opening goal. Memphis Depay was probably thinking about launching a counter-attack when Le Coq popped out in front of him. Coquelin passed the ball to Ramsey and from that point everyone will remember Alexis’ preposterously good flick. That was just one of Coquelin’s many brilliant actions on Sunday. Le Coq was all over Manchester United players making respectable yet aging midfielders Michael Carrick and Bastian Schweinsteiger look like an axis made of former players. With Nemanja Matić going through a rough period and Morgan Schneiderlin benched by Louis Van Gaal, it’s a safe thing to say Coquelin is the best defensive midfielder in the league. 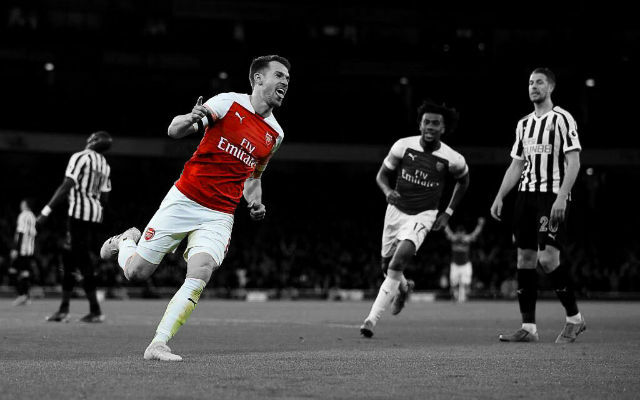 4.Aaron Ramsey’s contribution to our victory should not be diminished. Most people will remember Ramsey’s miss that should have been our fourth goal of the game which is unfair to our Welsh dynamo. Rambo made a perfect slide rule pass for Mesut Özil just before our opener and started the move for our third goal. The Welshman does need goals to feel better, to contribute to our victories in that way as well but he doesn’t need them to be recognized as an important player of our team. 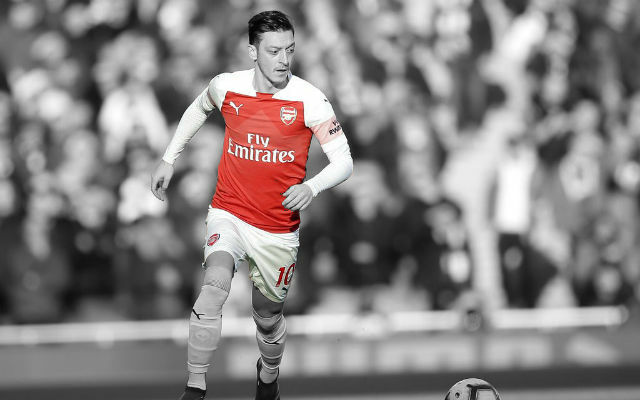 5.Mesut Özil has finally stepped up in a big game. 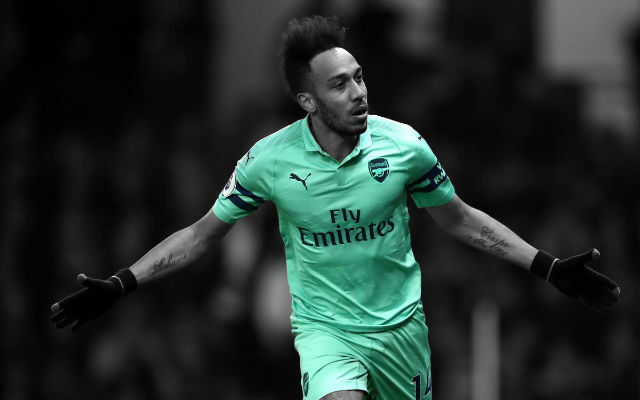 It was the Mesut Özil of our dreams, a space opener who pulls all the strings in the creative department, a Dennis Bergkamp to Theo Walcott’s Sylvain Wiltord and Alexis Sanchez’ Thierry Henry, a non-disputable wizard who sees things that are yet to happen. His finish left De Gea rooted to the spot and was the perfect conclusion to a well worked move that also included Alexis’ back-heel and Walcott’s clever pass back to Özil. What a way to open your goal scoring account! With Özil creating chances and scoring goals, Arsenal can give Manchester City something to think about. 6.Our defence is now the joint best in the league even if our central defenders made a couple of errors. Two short-comings from Per Mertesacker and Gabriel de Abreu went unpunished thanks to Čech’s brilliance. The absence of Laurent Koscielny was visible whenever Martial, a rare silver-lining in United’s defeat, was one-on-one with Mertesacker. Luckily, the rest of the team made sure it didn’t happen too often. Gabriel’s back-pass had also put Čech’s clean sheet bonus in danger but all that matters is that we didn’t concede. Prior to this weekend, United had shared the best defensive record with the Spuds – both sides had conceded just five goals in seven games – but now Arsenal, Manchester City, Crystal Palace, Watford and Spuds lead the league in terms of the least goals conceded (via premierleague.com). 7.Santi Cazorla doesn’t need possession to control the game. The little Spaniard played an integral part in our victory. He sprayed passes all around and controlled the midfield even if United had 62% of possession (via whoscored.com). In terms of possession percentage and effectiveness, it was close to our victory against Manchester City at the Etihad in February when Cazorla gave a masterful performance which suggests he is so good in controlling the midfield that he doesn’t even need the ball to do that. With Coquelin next to him and a mobile attacking department in front of him, Cazorla looks like a beard-less Andrea Pirlo. The odd goal from Cazorla wouldn’t hurt though. 8.Pundits words were shoved back down their throats. Neville’s observation about Arsenal not preparing well for the big games (via skysports.com) had been laughed off with strong arguments on this site even before our victory over United but it was torn to pieces by our players on the pitch – just like it was supposed to happen. Arsenal have played seven games against the Manchester clubs and Chelsea in 2015 and our record currently stands at four victories, two draws and a single referee-caused defeat with a goal-difference of 9:4. And, what to say about Michael Owen? If I were Owen, I would have kept my mouth shut until the end of time. Owen had labelled Alexis Sánchez and Mesut Özil ‘second-rate footballers’ before the game in which goals were distributed between the two of them (via sport.bt.com). 9.Theo Walcott’s performance was brilliant. It’s interesting to notice how Arsene Wenger had referred to Theo Walcott as a ‘No.9’ after the match (via arsenal.com). It was an intelligent sting from the French manager aimed at those who kept questioning his decision to play Walcott up front. The Englishman gave one of his best overall performances in an Arsenal shirt even if he didn’t score. He was doing his best impression of the performance against the bitter-sweet win over the Spuds that had left him on the sidelines for over a year because of an ACL injury. 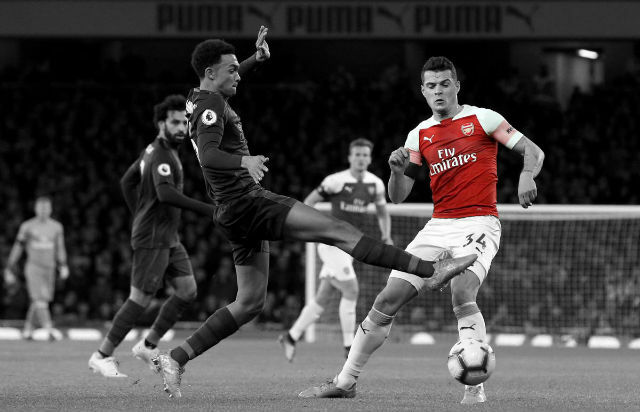 Theo has made a transformation from a false nine to The False Nine and it’s been a pleasure to watch how he stretches the opponents defenders all over the place. 10.Alexis is among the best in the world. “Ah, if I had had 11 players of Alexis’ attitude, I would have won the World Cup 1974,” Michels said. “Ah, if I had had 11 soldiers of Alexis’ attitude, I would have conquered the world and nobody would have heard of Waterloo,” Napoleon replied. Indeed, Alexis looks like a Terminator, an indestructable cyborg that never tires, a perfect machine enriched with a footballing talent. 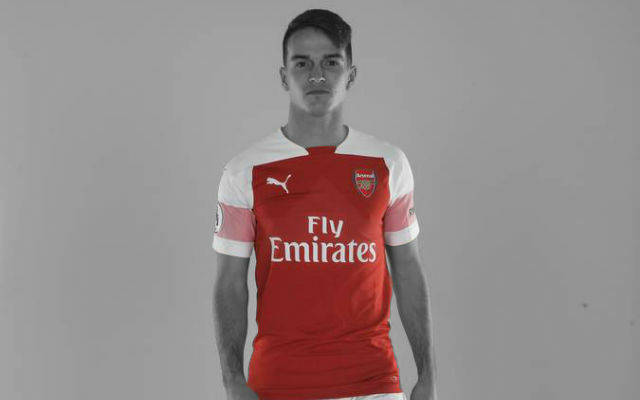 He is the best thing that has happened to Arsenal since Thierry Henry’s arrival in 1999 as the Chilean is a world-class player with very few rivals in the league (Sergio Agüero and in-form Eden Hazard can match Alexis’ brilliance). 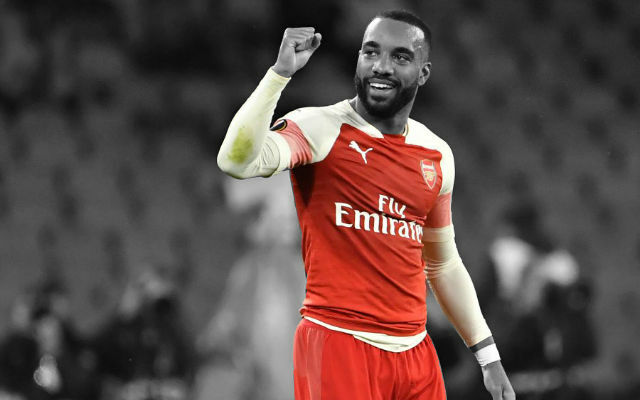 The fact he has scored six goals in our last three matches is not what impresses me – it’s that piece of brilliance that divides world-class attackers from the excellent ones. His flick for the first goal and a cannon-ball for the second weren’t just the best options available – they were the only correct options. But first things first. After the international break we are going to play Watford away and, before we get complacent for no reason, let’s not forget how many times we have lost the game against teams of Watford’s stature in the recent past. If we avoid complacency, we should win the game.